THE GATHERING DEAD Trailer from Stephen Knight on Vimeo. Work on this began in February 2012, initially with a team of artists from the former Rhythm & Hues effects studio. That fell apart in March 2013, when no significant progress had been made beyond some initial previsualizations and two mostly-rendered shots. A combination of Maya and MentalRay were used, and as such, none of the created footage could be salvaged. A new team was selected in April 2013, and Cinema 4D would represent the build environment. This team was significantly smaller than the first, which meant I had to pay more attention to the development and production process–basically, I was directing the trailer, albeit from afar. I have a wealth of project management experience, so I brought the required aptitude to the table. While the vendor was mostly professional, I found that the same evasive tricks were occasionally deployed when the schedule had been blown–“internet issues,” “rendering issues,” etc., etc. There’s not a lot one can do about this, so I adopted a stiff upper lip that would have left the British proud, while I and my partners merely continued to pay the bills. Finally, by January 2014–almost two years after the project began–I had a trailer that approximated about sixty percent of my vision. I decided I could live with sixty percent. One element hit one hundred percent, easy–Sean Beeson‘s score. The guy blew it out of the park, and he demonstrates a professionalism that’s pretty rare. Sound design was a very tricky component, and I’d have to rate that at sixty percent as well. I had to jump in and go hands-on in that regime, which is not my forte, but I found that Adobe Audition was easy enough to learn, and came with enough filters that I could use to at least approximate the sound quality I was going for. More learned listeners, such as the accursed Scott Wolf, will doubtless be aware that some sound effects are simply faked–they’re not real. This is where the true artistry comes in, as an experienced sound designer could take something almost totally unrelated and massage it into a sound effect that would fit the scene or sequence seamlessly. While I’ll give myself some small credit, there are simply some things that reverb, distortion, and amping can’t overcome. A sound engineer named Joe Cosgrove, who also voices Army Special Operations Command (designation RAPIER) in the beginning, lent his skills to the effort. I wish he’d had more time available, but he did what he could with what time he had. Editing was quite simple, as I have Premiere Pro at my disposal. (For a guy who’s been relegated to the backburner of the industry, I have all the professional tools I need.) One tie-up was that Joe used the competing product, Apple’s Final Cut, which prevented seamless transfer of sound files. We got around that by using common file formats, but some signal degradation was inevitable. As such, some effects, such as the alarm system in the Black Hawk, became barely audible after the score was laid in. I’ll consider this a casualty of war. Other items that bug me: the Black Hawk interior is totally fake in the sequence where McDaniels, Gartrell, Safire, and Regina react to the helicopter being hit by window divers. It’s a much more complex environment than what is displayed. The pilot (voiced by Sean Beeson) is sitting in the left seat, when he should have been in the right. The helicopter was spinning in the wrong direction, and for some reason, the compositor just couldn’t fix it (he did one version where the rotor spin was reversed, but that was about it). The troops’ helmets are modified bump helmets, and as such, are not exactly the right look…but this is splitting hairs. Real life operators will doubtless find fault, but given that the SF soldiers are fighting zombies, I’d say adherence to one hundred percent reality was never going to be achieved. Some buildings look unfinished, but other buildings look simply fantastic to me. Despite my complaints, there’s a lot here that’s right. Total negative cost: in excess of $15,000. If this was going to be just a book trailer, even the big boys don’t spend this kind of cash. At more than one point during the evolution of this product, my partners and myself began to doubt our sanity. Fifteen grand is a big chunk of change. This expenditure wasn’t made lightly. That money could have gone to a lot of other things, like additional behavioral therapy for my son, or an interest-bearing CD for my partners. But fate rarely coddles those paralyzed by indecision, and this isn’t meant to be just an amped-up book trailer. Its general utility is going to be in generating interest among potential investors, either for a live-action feature film or for a AAA video game. For a feature, the “real” entry point is upward of $35 million. For a AAA game, it’s at least $11 million. Either one of these is a huge, gigantic, incredible longshot. But if either pans out, the rewards will obviously eclipse the $15,000 payout. So the trailer is the first step in a long journey, but at least there’s something to show for it. I hope you’ll agree, watching the trailer makes the material an instant “get”–good guys are down in the city overrun by the dead, and they have to find a way to survive inside the Verbatim office building. I think that’s all I need to convey at this point–hook ’em and land ’em, then torture them with the full script and additional production design stuff. Who knows, maybe I’ll even get my old friend Andy Clement at Creative Character Engineering to provide some makeup effects designs to sweeten the deal–tough to argue against a guy who’s the most talented special effects makeup designer to hit the scene since Rick Baker. Not to mention Jeroen ten Berge‘s upcoming pre-production poster, which threatens to be even more eye candy. Some more about this. Obviously, everyone thinks their creative work merits a film. Just a decade ago, such a dream would have remained just that–a dream. Now, newer technologies make that dream more of a possibility. For a few thousand dollars, I can personally buy a camera that can shoot film-grade quality product, and one that doesn’t go through magazine after magazine of film. It uses data cards instead. I can output to 1080p, 2K, 4K, even 5K. I already have the software to do editing and compositing (not that I consider my skills up to the task, but if push came to shove, I could do it). New revenue outlets such as streaming are beginning to flex their muscles–Netflix alone posted earnings of over $1 billion on streaming alone. I don’t consider these new revenue generators to be sufficiently mature enough to replace either the domestic or international box offices–how many of you think that The Avengers brought in more money from pay-per-view versus theatre ticket sales?–but as supplementary streams, they most certainly add power to the punch. Difficulties, and here I concentrate more on film: Hollywood thinks zombies are on their way out. Despite the success of The Walking Dead and that overly-polished turd World War Z, folks in Tinseltown don’t want to hear about any more zombie properties. To them, he genre has always been a fringe one, and even though it’s super-hot right now (and has been for the past few years), like their less well-dressed brethren in the publishing industry, they think the genre is too low brow to really seriously consider. Regardless of what’s going on in the real world, this is a drawback. The industry maintains control over the distribution outlets, and those they don’t control would still rather distribute another Transformers movie than some low- to mid-budget zombie action flick written by some guy no one has heard about. Despite diminished output from the major studios, their controlling hands aren’t very far removed from the scene. I’ve made several runs at the industry (and received some excellent advice and kindly mentoring from the deceased Tony Scott), but the fact is this: Hollywood isn’t interested. Even when the profits are huge, if they don’t like the genre, or if they don’t know the guy making the pitch, their first instinct is to pass. “No” is the default answer, because if someone says yes and it blows up in their face, then they pay the penalty in reputational and perhaps even financial costs. I would note that this isn’t just prevalent with zombie properties; the same could be said for post-apocalypse stories as well, such as those by Joe Nobody and A. American. Even though I haven’t read works by either author, they have sold quite well, but for some reason, they and properties like them don’t get the time of day in Hollywood. So the only option is to make it another DIY project. Legally, if I were to encounter individuals who met the criteria as Class A investors and who were willing to take the risk, I’d have to form a separate LLC for the venture and offer the film through a Regulation D filing. This would convert the film from a neat idea and a fun project to an honest to God investment vehicle, which means it would fall under the governance of the SEC. I understand all of it, and it’s not a hard thing for me to do—I can file the paperwork and cover the fees myself. It’s going to be an interesting ride, that’s for sure. Now that this is complete, I need to huddle with my partners and determine what the next steps will be. Crowd funding for more dollars is always an option, so the trailer can be refined, or another one can be developed, along with more pre-production materials. I’ll likely have next steps in the coming weeks, but for now…I hope you like the trailer. But as a growing army of flesh-eating corpses takes over the streets and a violent storm renders airborne extraction impossible, McDaniels struggles to find a way out of the Big Apple. 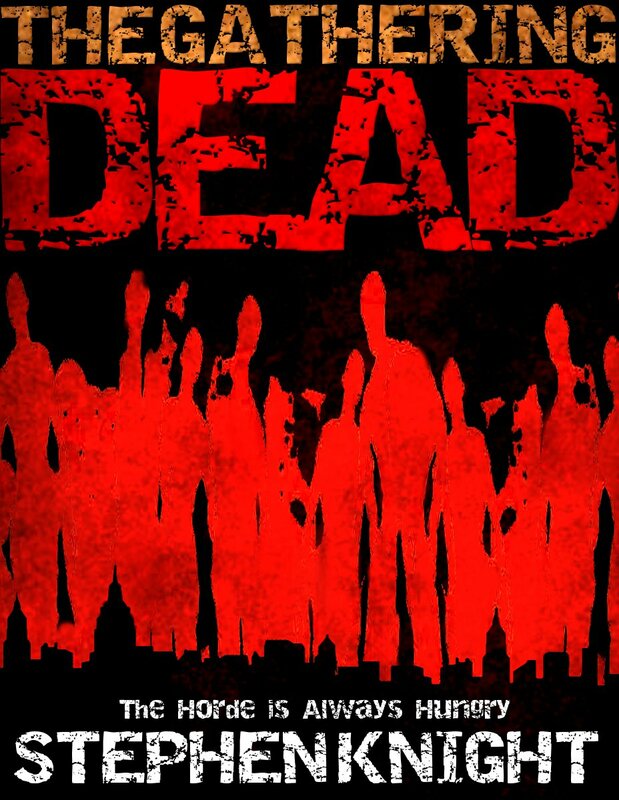 The odds of anyone getting out alive plummet further when slaughtered members of his own Special Forces team join the ranks of the gathering dead… with their military skills intact! For those who have already bought the book, you have my eternal thanks. You rock, one and all! For Field Sergeant Abran, the night was full of anything but surprise. The stout NCO rubbed his eyes and resumed staring out into the darkness beyond the well-lit walls of Tuono. The village was a small one, one of the smallest collectives which fell under the protective umbrella of Protectorate forces operating out of the fortress Jurnan. It was also one of the least exciting; Tuono’s population was made chiefly of farmers and agrarians and, to Abran, they were all a doughty lot. The only thing remarkable about the village was its proximity to the Great Artery–less than ten miles. “Ho, Field Sergeant,” a voice called. Abran turned and faced Lieutenant Mizra, the current commander of the village guard during this rotation. Abran stood straighter in his black armor, squaring his shoulders. Though Mizra had made it clear to the troops under her command that they need not salute her, Abran still tried to emanate the aura of a competent professional soldier. Partially because he took some measure of pride in serving the Protectorate; but also because he very badly wanted to share the Lieutenant’s bed. Though both Sergeant and Lieutenant were married, both had evidently lost consciousness during the recitation of the vows of monogamy. Abran had shared the night with several female footmen, and Mizra had made her availability known to the men which served beneath her. “Ho, Lieutenant,” Abran replied in the like. “What brings you to the wall, at this hour? Surely you don’t intend to inspect the sentry postings?” Though her marital vows were suspect, Lieutenant Mizra’s competency was far from appearing tarnished; she was a thoroughly efficient platoon commander. Indeed, at times her efficaciousness bordered on the maniacal. “Not at all, Field Sergeant. I just can’t find sleep, this night.” The Lieutenant stopped beside the burly Sergeant and peered out into the night’s black vastness, resting her elbows against the wall’s ledge. She wore her brown duty uniform, her sword and shuma hanging from her belt. She must have re-sewn the stitching in the uniform’s breeches, Abran saw, for where it should have been baggy, it clung to the Lieutenant’s body almost like a second skin. The Field Sergeant let his eyes wander over the Lieutenant’s svelte figure, smiling to himself in tacit approval. The flickering torchlight only served to further flatter the young woman’s lean, athletic frame. Abran snorted. “Well, Lieutenant, I wouldn’t worry much about that. Tuono’s never been attacked, not even once. Whatever things wait on the other side the Artery know better.” This wasn’t entirely true–through the village had never been the victim of a direct assault during the Field Sergeant’s eleven years of service, mysterious and sometimes gruesome events had transpired. Such as the time when all newborn infants had been snatched from their cribs during the night, and the incident when the village elder had been crucified to the ceiling of his very own home–without his family ever hearing a thing. Abran shuddered slightly beneath his armor. Nighttime wasn’t the best occasion to contemplate such things. Mizra evidently sensed her senior noncommissioned officer’s mood, or perhaps had seen him shudder. She touched his hand lightly, and Abran looked at her. “Are you cold, Field Sergeant?” she asked, her voice slightly husky. Abran could scarcely believe his luck. He managed to contain himself, however, and nodded back to the willowy woman. “As you wish, Lieutenant,” he said. Mizra smiled back at him, then turned and walked down the parapet, heading for the the ladder which led to the village below. Abran watched her from his post, shaking his head slowly, marvelling at his luck. A guard further down–Tobor–saw the senior noncommissioned officer’s expression, and he smiled in understanding. Abran turned away and gazed back into the night. He heard a sudden rustle, and he caught an abrupt flurry of movement from the corner of his eye. He whirled, his gauntleted hand automatically finding the haft of his sword. Abran looked in the direction Mizra had been walking; he could see no sign of her. Surely she couldn’t have reached the ladder that quickly? he wondered. Then he noticed Tobor was gone, as well. Through the flickering torchlight, Abran could make out Tobor’s shuma. It was lying on the wooden decking by the wall, right where the sentry had last been standing. The Field Sergeant ripped his sword from its scabbard, taking a step back from the wall. He opened his mouth to cry the alarm; a sentry from along the west wall beat him to the punch. The voice was dimmed by distance, but its content was not lost on Abran. It was full of fear. The torches lining the east wall suddenly erupted, the flames being extinguished in favor of gushing torrents of blue-green sparks. Abran crouched down low as a bolt of fear raced through his body. Through the wavering, dimming light, he could see shapes moving through the gloom, sweeping up and over the wall like mercuric spiders. “They’re coming over the east wall!” he screamed. Something moved toward him, and he slashed at it viciously with his sword. He felt the blade make contact and bite into his opponent; an instant later, something slammed across his head with such fury that his helm went spinning off into the darkness. Abran crashed into the wall and slumped to the deck, senses completely addled. He shook the cobwebs from his head a moment later, hearing screams not just from the wall, but from the village below. “Ho, Field Sergeant,” whispered a familiar voice, very close to him. Abran gasped and tried to struggle to his knees, but his limbs remained limp and unresponsive. A queer tingling sensation had fallen over his body, as if everything from his neck down had fallen asleep. His sword lay beside him, its blade knicked and charred. Shapes slithered and crawled over the wall, passing by his motionless form without even the smallest of pauses. He realized then that, despite his every attempt to regain both footing and sword, he was completely paralyzed. A lean figure approached him, barely discernable in the light generated by the shooting sparks. All the husky Field Sergeant could do was stare in overwhelming horror as Lieutenant Mizra knelt beside him, her movements slow and sinuous. He noticed the vicious slash marks across her chest and throat; her padded tunic had been torn, and he could see ravaged flesh and bone through the rents. Mizra reached out and touched his face. Her skin was as cold as death, and a thrill of revulsion ran through the Sergeant’s useless body. He was forced to look into the Lieutenant’s face. Her skin was gray-green and bloodless, and her eyes were completely black, devoid of any sympathy or warmth. When she parted her full lips, murky light glinted off spiked fangs. Abran tried to scream as the Mizra-thing opened its jaws and tilted his head back, exposing his neck. His voice, like everything else, had ceased to operate. The village of Tuono was completely overrun by the hordes of darkness less than twenty minutes later.